SCOTTSDALE, AZ--(Marketwire - April 23, 2008) - NKK Switches, the world's leading designer and manufacturer of innovative electromechanical switching devices today announced the availability of the new high resolution SmartSwitch and SmartDisplay. These switches provide design engineers a unique programmable human interface that simplifies how users interact with machines -- particularly in fast-paced environments such as broadcast equipment or medical devices -- by using a changeable graphical interface. The high resolution SmartSwitch and SmartDisplay are LCD programmable pushbutton switches and displays with RGB LED backlighting that operates commands supplied via the SPI communications protocol. Both devices feature a programmable and changeable 64 x 32 pixel LCD module with 64 backlit colors that displays graphics, alphanumeric characters or animated sequences, including four lines of text with as many as ten characters per line. "With so many distractions facing operators of equipment in today's fast-paced world, the use of graphical displays on programmable switches helps workers do tasks more efficiently and safely," said Lou Molinari, Vice President, Product Marketing at NKK Switches. "Design manufactures are increasingly looking at new programmable switch technologies that interact with the complete system or design, provide ease-of-use and simplify multi-decision operations." The High Resolution SmartSwitch and SmartDisplay incorporate bitmap display functions with a variable brightness backlight that is variable in eight steps from dark to bright. The integrated liquid crystal display provides a wide viewing angle with high contrast and clarity. The SmartSwitch and SmartDisplay have a FSTN positive black and white LCD mode, with a LED backlight capable of generating 64 colors. Epoxy sealed straight PC terminals prevent entry of solder flux and other contaminants. The SmartSwitch is highly reliable and provides a long life of one million actuations minimum. The wide viewing area of the switch is 15.0mm x 10.8mm (horizontal x vertical), for the display is 13.9mm x 10.6mm (horizontal x vertical). 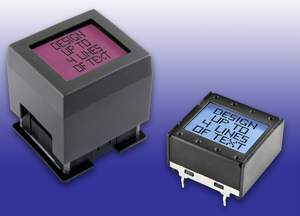 NKK's high resolution LCD programmable switches and displays are suited for a wide variety of applications requiring a graphical user interface or real-time sequencing. The SmartSwitch product line simplifies and improves complex multi-decisional operations in string-dependent switch systems. Applications include audio-video broadcast workstations, industrial control panels, medical equipment, and communications systems. A leading designer and producer of electromechanical switches, NKK Switches offers one of the industry's most extensive selections of illuminated, process sealed, miniature, specialty and surface mount switches. The company manufactures more than four million toggle, rocker, pushbutton, slide, rotary, DIP rotary, keypad and keylock switches. All switches are designed and manufactured to provide the quality and dependability that has made NKK the benchmark for reliability for over half a century. NKK continues to lead the industry in responding to the needs of the marketplace with innovation, high reliability and a commitment to excellence. The company provides environmentally safe products for its valued customers, including the myriad of issues that are covered under the RoHS directive. NKK maintains a complete network of qualified representatives and distributors through the United States, Canada, Central and South America, Europe and Asia. Engineers who design the man-machine interface for their products rely on the broad product line, specialized design expertise and customer support of NKK Switches. For more information, contact NKK Switches, 7850 E. Gelding Dr., Scottsdale, AZ 85260. Phone 480/991-0942. Fax 480/998-1435. Visit the NKK Web site at www.nkkswitches.com.